How to Write the Best CDR-Report for Engineers Australia Online? CDR or the Competency Demonstration Report is the very first step for aspiring engineers from all over the world to live and work in the country of Australia in technical positions at various reputed companies. Engineers from any branch can opt for a CDR application. In this regard, they need to compulsorily qualify the CDR report by an association known as the Engineers Australia (EA). In writing the CDR for Engineers Australia, you need to follow the EA guidelines very carefully. The latest guidelines are always available on the official website of the Engineers Australia (EA), and the MSA booklet is to be downloaded for free from that website. What are the Components of a CDR Report? An Updated CV: You always need to enclose your updated CV with your CDR. 3 Career Episodes (CE): These are like small essays that describe your professional skill and experience in the technical field. Summary Statement: It is to be written in 1 page and a single paragraph. This is a summarized form of everything mentioned in the Career Episodes (CEs). Continuing Professional Development (CPD): The EA needs it for the Migration Skilled Assessment process. It shows how you are keeping yourself updated in your field. How to Write an Ideal CDR for Engineers Australia? Before starting to write the CDR, understand the purpose of the story very carefully. Each of the 3 Elements of the CDR report-Career Episodes, Summary Statement and the CPD, each of these elements serves very importantly in your career highlight. Thus, you always need to write each element with a lot of care and attention. Always choose the right topics for your 3 Career Episodes (CEs). The EA assessors only want to know about you and not your companies. Thus, always try to highlight your technical skills and experiences in the report. In most of the cases, the EA selectors read the Summary Statement part; first, this write-in in the most interesting way. Write all the three Career Episodes in 1st person ad in an active voice. Enclose the scans of all your previous qualification as well as experience certificates duly signed by the concerned authority along with your CDR. Your latest passport number should also be given with the CDR application form. 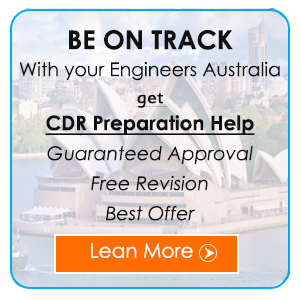 If you follow all the tips mentioned above, you can get your CDR selected by the Engineers Australia (EA) team. Availing a reliable CDR for Engineers Australia writing online service can be the best option for you. The expert can write the CDR reports exactly as per the EA parameters. Thus, you have ample chances of your CDR being selected by the EA. You can also get Case Study Help Solution and all academic subject assignment writing help here. Get Best CDR Preparation for Australian Migration‎ Skill Assessments - We Provide CDR Report, Summary Statement Help, CDR Writing Service, CDR Sample, and Review CDR etc. How Can I Find the Best CDR Writing Services for Engineers Australia? How to Prepare the Top CDR Engineers Australia Application? How to CDR Engineers Australia Selected? How to Write a CDR Report for a Mechanical Engineer? How to Present a Successful CDR Report? How to Write a Successful CDR Report for Engineers Australia? How to Get the Top Online CDR Report Writing Service? Subscribe to get our weekly offers directly in your inbox!